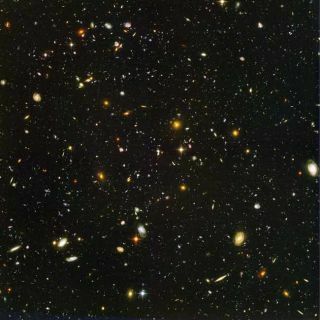 This view of nearly 10,000 galaxies is called the Hubble Ultra Deep Field. The snapshot includes galaxies of various ages, sizes, shapes, and colors. The smallest, reddest galaxies, about 100, may be among the most distant known, existing when the universe was just 800 million years old. The nearest galaxies--the larger, brighter, well-defined spirals and ellipticals--thrived about 1 billion years ago, when the cosmos was 13 billion years old. Left-hand side: An image of a laser-produced shock wave. Brighter colors corresponds to regions of higher density or temperature (i.e., a shock). Right-hand side: A simulation of a collapsing shock wave arising during the pre-galactic phase. Little is know about the ultra high-energy cosmic rays that regularly penetrate the atmosphere. Recent IceCube results challenge one of the leading theories, that they come from gamma ray bursts.